A three-wheeled car that measures just one metre across and carries two people could be the answer to our growing traffic crisis, its developers say. The Clever (Compact Low Emission Vehicle for Urban Transport) car has been developed by nine European countries and is funded by the EU. 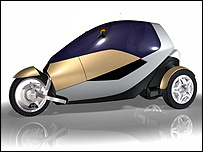 The novel tilting vehicle aims to combine the safety of a traditional car with the flexibility of a motorbike. 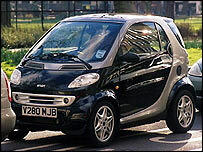 If produced, the 50mph car could sell for £6,500 after December 2005. It has a metal frame with a roof at about the same height as a normal car and seats one passenger behind the driver. A hydraulic tilting chassis is being developed by scientists at Bath University to make the car stable at high speeds. Jos Darling, a senior lecturer in mechanical engineering at the university, said the car marked a "tremendous leap forward" in the development of vehicles. "The increase in traffic in our towns and cities means that we have to find a way to make our vehicles smaller," he said. "The advent of micro cars is a sign of this, but with its manoeuvrability and small width, the Clever vehicle is the ultimate in the search for a small vehicle to get around cities. "The fact that it has a stylish design, can carry a passenger, is not open to the weather and is as high as a conventional car, will mean it will be much more popular with motorists than previous novel city vehicles." The Clever car costs about a fifth of a conventional vehicle to run and is quieter and less polluting because it runs on compressed natural gas, its developers say. This means it would not be liable for the congestion charge in London, or any other city where the charge is adopted.